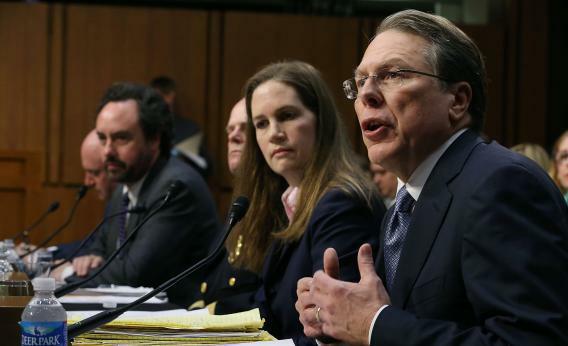 Wayne LaPierre, Executive Vice President and Chief Executive Officer National Rifle Association, testifies during a Senate Judiciary Committee hearing on gun violence on January 30, 2013 in Washington, DC. The NRA’s volcanic spokespundit begins his State of the Union response tour in the virtual pages of the Daily Caller. (Given that the DC runs a gun giveaway contest, it’s a perfect pairing of voice and medium.) It’s as coherent as you’d expect, but it includes a rhetoric shift that the NRA’s been making more and more since a “gun ban” of any kind became politically ludicrous. Used to be that you had to fear a powerful government taking the guns away, depriving you of the power to resist tyranny. Now, you have to worry about the government collapsing, leaving you in a Mad Max universe with no gasoline. You could pause here and ask which gun prohibitionists see this as “utopia.” It’s as fatuous as suggesting that Randians all want to emigrate to Somalia. It’s also mostly false, because many looting rumors were bogus, and—famously, we thought—murders slowed, then stopped, during the blackout. But forget it, Wayne is rolling. The NRA’s long journey into “prepperism” has been fascinating to watch. The gun lobby even sells a Ragnarok-ready machete with its logo on the handle. But it feels like one more feint that alienates the NRA from the gun owner it’s supposed to represent. How many recreational gun owners are 1) worried about an apocalypse, and 2) have guns or ammo clips that stand any chance of being banned right now?